The honeymoon was wonderful and Carrie and Sidney were having so much fun seeing the sites, relaxing and of course Sidney's favorite part, making love to Carrie every night. No one cared who Sidney was and that was a wonderful break too. Carrie and Sidney could wander around and actually relax and be a normal couple on their honeymoon. No cameras or interviews it was perfect in every way possible. They enjoyed having romantic dinners together and walking on the beach at night. They made the most of being a couple and have fun together. Finally it was time to head back to the real world and the twins. Carrie and Sidney were getting their bags together so the bellman could take them down to the lobby and then they were headed to the airport. "Sidney, I have have so much fun and I hate to leave but I know we need to get back to our lives. And I miss the twins so much" Carrie said as she put her arms around Sidney's shoulders. He put his arms around her waist and smiled down at her. "Yeah its been awesome and I hate that we have to go back too. I miss Ava and Aaron and all their silliness too". They headed to the lobby and checked out and then were off to the airport. They checked in at the airline counter and then headed through security. They got to their gate and had a little bit of time to wait until their plane left. They wandered around some of the airport stores and then finally went back to the gate and sat down. While they were sitting waiting for the plane, Sidney noticed some guy that kept looking over at Carrie. She was busy reading a book so Sidney nudged her, "Hey doll face do you know that guy over there? He keeps looking at you" Sidney said looking concerned and annoyed. Carrie looked up at the guy Sidney was talking about and then her face went pale. "What's the matter Carrie?" Sidney said now looking really concerned at Carrie. "That's.....that's...uhm...oh gracious..." Carrie stuttered, "Its Jack!" she finally said. "What? Its Jack. 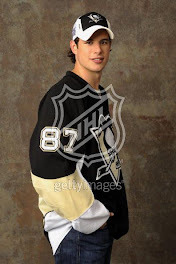 Whoa, you know what I really want to do to him" Sidney said sounding pissed off but Carrie put her hand on his leg. "Sidney, hey that's the past and I don't want a scene and neither do you. Got it buster!" Carrie exclaimed. "Fine for your sake but if he says anything that I don't like I don't care about my reputation. All I care about is you" Sidney said trying to calm down. "Thank you Sidney" Carrie said giving Sidney a quick kiss on the cheek. Sidney smiled and went back to his magazine. A few minutes later Jack walked over to where Carrie and Sidney were sitting. "Carrie, Carrie Addison is that you?" asked Jack as he stood near them. Carrie looked up and smiled, "Hey Jack, how are you doing? Its been a long time and its Carrie Crosby now" Carrie said as she showed off her wedding band. "Oh wow congratulations, Carrie. You look great" Jack said admiring at how happy and amazing Carrie looked now. "Thanks Jack. This is my husband Sidney" Carrie explained as Sidney stood up and shook Jack's extended hand. Carrie stood too and they chatted for a few more minutes and then the flight attendant started calling that they would board shortly. Carrie was thankful that Sidney was respectful of her wishes not to act crazy because of what Jack had done to her in the past. Jack told them he was divorced and did not have any children and that he worked as a scout for the Bakersfield Condors, which are the minor league team for the Anaheim Ducks. It ended up being a decent conversation even though Sidney wanted nothing more that to punch Jack's lights out. The flight attendant started calling out for passengers to start boarding and that ended the conversation and Carrie and Sidney headed for their flight. They got to Halifax really late but Sidney's parents met them at the airport. Taylor was babysitting the twins at the house. "How was your trip?" Trina asked as they were in the car heading home. Carrie was leaning her head on Sidney's shoulder because she was exhausted but Sidney actually had a little bit of energy and so he talked for both of them. "We had a great time and it was so relaxing. We both really did not want to come back home except that we both really missed Ava and Aaron tons" Sidney said as he yawned and then looked down at Carrie who had ended up falling asleep. "You two look so relaxed and happy. I am glad you had a great trip" Trina whispered as she too noticed that Carrie was asleep. Sidney just smiled at his mom and then looked out the car window. When they got home, Taylor had stayed up just so she could see Sidney and Carrie. "Hey Taylor" Sidney said as he walked over to his sister and gave her a hug. "Hey Sid, did you have a fun honeymoon?" Taylor asked. "Yeah it was fun" Sidney said and then moved back so that Carrie could give Taylor a quick hug too. "Hey Taylor. Thank you for helping out with Ava and Aaron" Carrie said. "I love watching my niece and nephew anytime. They are so cute but they are constantly moving" Taylor laughed. "I bet so" Sidney said keeping his arm around Carrie's waist. They all headed off to bed but Carrie and Sidney went and checked on the twins, who were sleeping in a room that had been converted into a nursery just for them. Carrie and Sidney gave them each a kiss and then headed straight to bed themselves. "Hey Sidney" Carrie called out to Sidney who was in the bed already. "Yeah doll face" Sidney responded looking at her as she walked out of the bathroom. "I am really glad to be home" Carrie said as she slid into bed and Sidney pulled her towards him. "Yeah I am too" Sidney said as he gave Carrie a goodnight kiss as they snuggled together and went to sleep.